Philip le Maistre has just started to harvest his Jersey Royals from the fertile soils of the steep south-facing 'cotils' (slopes) at Master Farm. 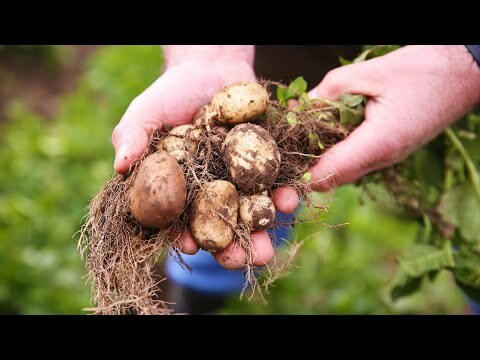 These slopes benefit from sunshine throughout the winter months, and have excellent drainage – all crucial elements needed when growing perfect Jersey Royals. "People have tried to grow them elsewhere but have been unable to," says Philip. "They are difficult to grow – we save all our own seeds and are very selective. We plant them all by hand – it’s very labour intensive." They're also harvested by hand as the slopes are too steep to use machinery – they're so steep you can barely walk up them! Philip’s devised a very clever basket and pulley system to solve this problem.